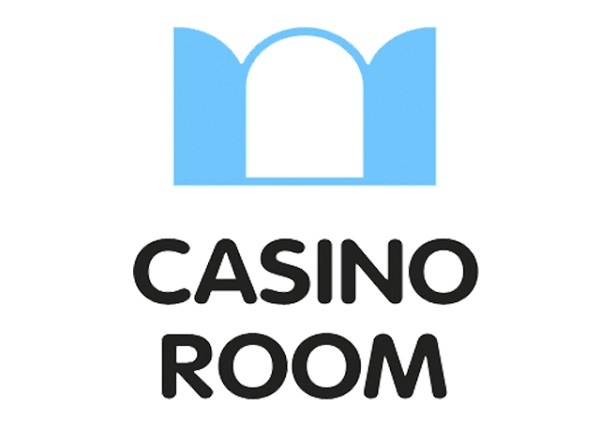 Casino Room is a next generation online casino combining traditional casino games with gaming-style rewards, XP, achievements and missions, but is it any good? In a word.. HELLYEAH read on to find out why. Signing up is straightforward, this is a modern online casino and there’s no client program to download or any of that malarkey, you’re straight into the action after giving your name and email address. You’ll also need a phone number to receive the sms verification which arrives immediately making the whole sign up process done in under minute. The tagline of Casino Room is Missions. Friends. Rewards. And as soon as you enter the lobby you can see this is no ordinary casino site. 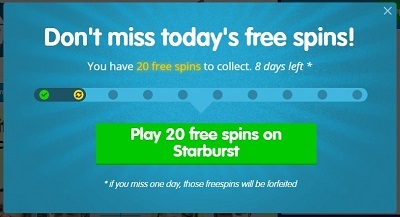 By this stage I’ve already got 50 free spins on Starburst and things are looking good, a member of staff pops up in a chat box and gives zero hassle, simply saying he’s there if I have any questions. Good stuff. The main menu holds promises of adventurous times ahead with an XP counter, mission briefing, and my current planet – The Celestial Cupcake. Further, more exotic planets await as I progress through the levels. Fabulous! Navigation is really easy, it’s one of the most intuitive interfaces we’ve ever seen at an online caisno site. The main menus for Games, Account and Missions is at the top while everything else you could possibly need on the site is available at the bottom of every page. 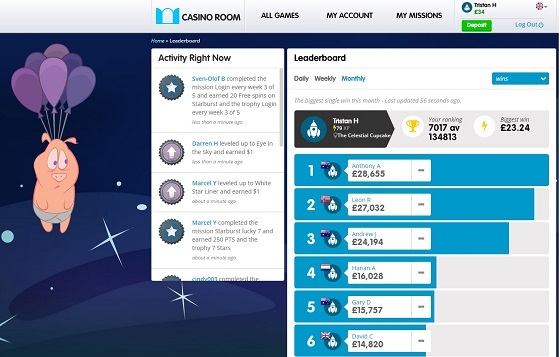 You can see that this is a social casino site, with facebook integration and daily, weekly and monthly leaderboards and competitions, the social dimension of casino gaming that Casino Room is pioneering is clearly the future of online casinos. 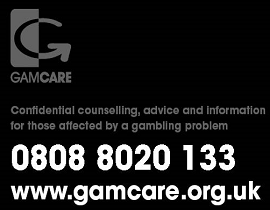 It’s very obvious at this point of my Casino Room review that this is not a fly-by-night operation, they are signed up with all the industry regulators and operate with a full UK Gambling Commission licence. So as you’d expect banking is a breeze with all major deposit methods accepted – Neteller, Skrill, Visa, Mastercard, Maestro and Paysafecard. The sign up bonus is up to you – you can choose a monster 500% bonus up to £50, a very generous 200% up to £200 or simply 200 free spins. Whether you deposit or not you will get the standard 50 free spins for signing up, no deposit required. There is a similar range of bonus choices on your first five deposits. This all adds up to one of the most generous sign up offers that we have ever seen. Having said that I only had £20 to spare for my review but getting £60 to play with is still nothing to be sniffed at especially with the extra money on top of that that I won with the free spins on Starburst. Wagering requirements to cash out the bonus money are 45X which sounds a lot but actually isn’t because it’s only the bonus amount you need to wager, not bonus + deposit. There are around eight hundred games here overall which is a huge amount compared to some casinos and should be more than enough for most players. All the latest slots are here such as Gonzo’s Quest, Theme Park and OMG Kittens which to us shows that they’re invested in keeping the casino bang up to date with the latest games from top developers. Net ENT, Play n GO, Thunderkick and Betsoft are just some of the more than a dozen game providers that Casino Room makes use of so if you’re a fan of any of these game makers you will find something to tickle your fancy. 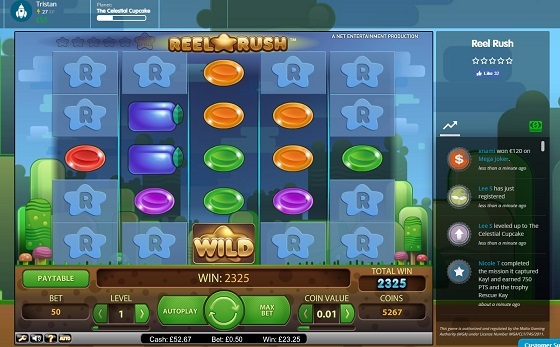 Continuing my Casino Room review I had a quick spin on Reel Rush from Net Ent which is one of my favourites and won a nice amount almost straight away. It gave my XP a bit of a boost and certainly got me in the mood to complete some of the missions and see what would come up next. A nice touch was being able to see what other players were winning at the same time in a handy menu on the right.Bar Bar Black Sheep is another of my favourites and although my luck wasn’t in I was surprised to see that my bonus money was held back while playing it – it seems some games don’t count towards wagering requirements but instead of this being a nasty surprise somewhere down the line they are up front with you and simply don’t allow the wagering to happen in the first place. I realised afterwards that if you click on ‘bonus games’ then it lists every game that you can use to meet the bonus requirements, and it’s a pretty comprehensive list. This is a good, considerate feature and we wish more casinos could be as transparent. I was slightly disappointed that there weren’t more live casino options, there’s a live dealer blackjack and live dealer roulette game both from Net Ent. The blackjack was as good as you’d expect from Net Ent and I gave it a whirl using my favourite betting technique (keep betting the minimum amount until you lose, then keep doubling the bet until you win) and managed to come out with my balance way back up. There are currently ten progressive jackpots at Casino Room ranging from the £10,000+ Keno bonus jackpot to the eye-squelching £8m Mega Moolah jackpot, passing through the legendary Major Millions, King Cashalot, Arabian Nights and Cosmic Fortune progressives. 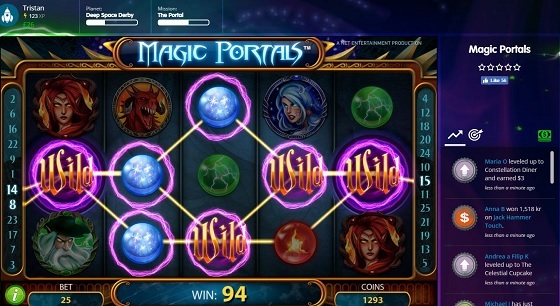 As part of my Casino Room review I decided to try my hand at one of the missions – completing 20 rounds on The Magic Portal, one of the slickest and most atmospheric slots around. When I cleared the rounds after some profitable wild streaks I was awarded a shedload of XP and the Magic Portal trophy, this was enough to level me up two whole levels from Celestial Cupcake right past Deep Space Derby and onto Dharma Queen, happy days. 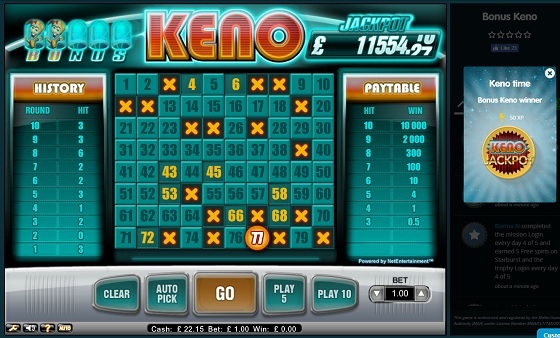 Keno is always good for a laugh so I was delighted to see there was a mission for playing ten rounds of bonus Keno. I still had £20 left and there’s always the chance of huge payouts with Keno and in any case I would be able to get my hands on a shiny new trophy and bundles of juicy fresh XP. I won my trophy but then went for the jackpot and upped my stake to £5 a shot which quickly used up my money despite a big win along the way. One thing’s for sure, I’ll be back for the daily free spins and more than likely will dip my toes into some real action again to try to get onto that leaderboard, or at the very least try to get up to the higher levels where the bigger and better bonuses are waiting! Casino Room is without a doubt the rising star of the new wave of no download casinos with its slick professional interface and game-changing emphasis on social interaction and rewards. Hopefully it’s a sign of things to come that these awesome innovations are becoming more common in online casinos and with any luck we’ll see many more exciting features coming out in the near future. One thing’s for sure – Casino Room will be at the leading edge of any new developments and it’s a pleasure to recommend it as one of the very best UK online casinos.